A special focus in all of our work is on families who are in transition and are learning how to celebrate life in their new situations, especially understanding and transforming patterns of behavior and communication in these families. The format of Animal Assisted interventions actively engages horses in the work of advanced human development and leadership training, teaching assertiveness, personal empowerment, relationship, intuition and emotional/social fitness skills. The overarching objective is to assist and support clients in learning a new way of being, one that emphasizes authenticity, collaboration and experimentation in personal and professional interactions. Why horses? Horses provide a much clearer reflection of our true nature. They have a tremendous capacity to mirror—and accept—our authentic feelings, desires, frustrations, and untapped gifts. In this way, they allow us to see more clearly who we really are and, over time, help us discover how to bring our unique perspectives and talents into the world. Horses have a tremendous capacity to highlight our hidden gifts, our wounds, our vulnerabilities, and our worn-out worldly habits. And yet somehow they manage to be discerning without a hint of judgment, communicating that at the core, we too are beautiful, powerful, and wise, capable of endless renewal. Nonverbal intelligence is grossly underdeveloped in modern society. Horses are remarkably efficient at drawing attention to the feelings, intentions, and perceptions behind our words. The inability to engage a confident presence through emotionally-centered, empowered body language creates a vacuum that unconsciously invites others to take advantage. The horse either ignores this person or moves him or her around, taking charge of the relationship, just like the person’s employees, spouse, and children are apt to do. 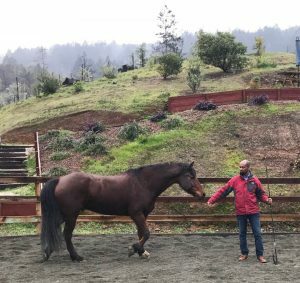 Yet as participants are coached in how to set boundaries and motivate the horse, they find that this magnificent animal is just as happy to cooperate, and a real dance of mutual respect and co-creativity begins. All of this happens through interactions that can be thrilling and deeply moving, a powerful way to learn new tools for successful relationships. Participants learn how to use these tools and experiences to change irrational thoughts and dysfunctional patterns, which have kept them stuck in a survival mentality, and help them move into a thriving place for more creative and productive lives. Participants practice how to engage in mutually respectful relationships with others. They discover how to use emotions as information, as horses do, as well as learning simple yet powerful techniques for enhancing physical as well as mental and emotional health. Clients explore assertiveness, stress reduction and emotional fitness skills, strengthening self-esteem and personal empowerment in the process. Consensus-building relationship models teach people how to take the reins of any situation without lapsing into the pitfalls of dominance, alienation, intimidation or victimization. Many programs also employ journaling, mindfulness techniques, expressive arts and music to enhance intuition, multi-sensory awareness and creativity. Through a series of specially designed activities, participants deepen awareness of personal challenges, core feelings and areas of bodily tension that inhibit their ability to reach their true potential. A tremendous boost in self-esteem and confidence comes from learning how to establish boundaries and direct a thousand pound creature through mental focus, presence and clarity of intent. These skills, which can be difficult to teach in a conventional classroom, business coaching, or counseling session, have far ranging applications linked to increased success in personal relationships, career and parenting.